Perhaps the most daunting task of finishing out the interior of our cabin by ourselves was sanding and staining the interior walls, doors and trim inside our home. “Phase I” of this process involved sanding all the interior walls and ceilings. Just doing the vaulted ceilings was a massive two-week undertaking. While the hubby had tremendous help from our youngest and the DSL that first weekend, the hubby was forced to take some vacation time and do most of it himself. After looking at several log cabin magazines, I had one fear and I have a sneaky suspicion many log cabin families fear the same thing: making the cabin too dark. 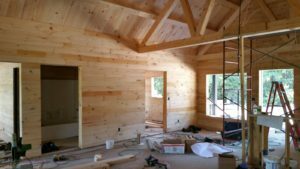 Our neighbor says and I agree that one does have to install more lighting in a log cabin than in conventional housing because the logs are already going to naturally darken the room and absorb light. This project caused another glitch we hadn’t anticipated–our daughter and DSL had just announced she was pregnant with our first grandchild and the fumes from staining drove her crazy with that lovely first trimester of nausea. It sidelined her quite a bit and she had to leave our cabin and go to the neighbor’s in an effort to keep from exposing herself and the baby to those nasty fumes. Even with using fans and leaving doors and windows open, it still seemed to get to her. Another issue? We had to erect and move scaffolding (three levels of it!) to get to various ceiling and ceiling beam areas. To move it to different parts of the room often meant disassembling it and re-assembling it to get around the log bracing, etc. We wound up buying used scaffolding because it was cheaper than renting it for the amount of time we were going to need it. The scaffolding was heavy, awkward, and resisted this moving process most of the time. It also made it difficult to get from one end of the cabin to the other when just trying to eat, clean up, and rest! It was a painstakingly slow process that took another until the end of October to complete. And then just the regular staining of the walls was another arduous process. We finally bid out having someone come in and finish up the job and it was the best money we ever spent. We might still be staining if it weren’t for this decision and it was cheaper than we had thought it would cost. And trust me…there was more staining and sanding to come. Long story short? The stain is beautiful, but it was one ridiculous process to get it done. When we build on Serenity’s lot, I think we will include indoor sanding and staining as part of the budget and not elect to do it ourselves ever again! This entry was posted on Wednesday, April 25th, 2018 at 2:51 pm and is filed under Log Rhythms. You can follow any responses to this entry through the RSS 2.0 feed.